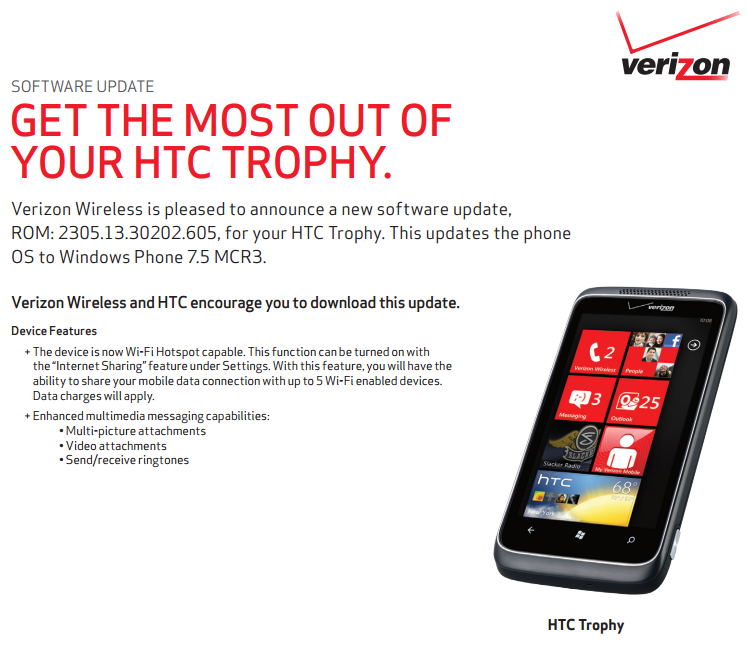 Verizon have returned with an announcement that the Windows Phone Tango update is almost ready to fire up for their HTC Trophy handsets. Customers will be able take advantage of new features and functionality in the next version of Windows Phone. This will begin to prep consumers for the Windows Phone 7.8 update which is sat on the horizon. However, it seems Verizon also got slightly too excited when updating their software upgrade table. While they listed Tango (MCR3) as the update in the PDF, the table below tells a different story, Apollo is apparently on its way. As one can see in the above image, it clearly states "Apolio" in the last column. Whoops. Before anyone spins this as rumour that Verizon is somehow ready to push out Apollo (even though it's not an upgrade for current and first generation Windows Phones), we thought we'd kill this in the bag right now and state that this is not the case. Tango is on the way, that's all. Good news for those who are eagerly awaiting Tango from Verizon. Are you looking forward to updating? Let us know in the comments. Source: Verizon (PDF), Android Guys; thanks, aphrophyre, for the tip!